Partnership and Teaching NGO (P&T NGO) is an Armenian non-profit organization founded in 2000 to support education management, innovation in education, inclusivity in education, community conflict resolution, community development, and civil society engagement. We partner with NGOs, government at national, regional and local levels, and with a diverse range of businesses, to help Armenia develop and grow stronger every day. 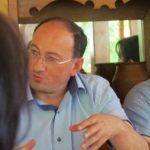 Our reputation for professionalism, transparency, reliability and high performance has made us a leading service provider sought out by international aid organizations seeking to effect lasting change in Armenia. We help organizations develop institutional capacity that leads to effective operations. In 2009 Partnership and Teaching NGO was certified by Counterpart Armenia, which assessed our institutional capacity in compliance with international standards. 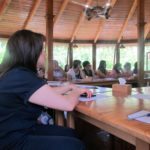 The assessment was facilitated by USAID and Counterpart Armenia professionals, who evaluated organization management and governance, financial stability, external relations and quality control, human and material resources management, financial management, and grants management. Partnership and Teaching NGO’s certification confirms its reputation as a leading and reliable organization working to international standards. An initiative to make our schools more child-friendly, in collaboration with UNICEF and the Republic of Armenia Department of Education. The implementation of Student Council regulation in collaboration with the Republic of Armenia Department of Education. The design and implementation of a national school management information system in collaboration with the government of Switzerland, UNICEF, the Armenian Department of Education and Yerevan municipality. The administration of the annual National Poetry Recitation Contest, Armenia in partnership with the U.S. Peace Corps. Partnering with USAID to administer their Civil Society Organization Development project. P&T NGO provides capacity-building training for NGOs in every marz, on topics including NGO Management, PR and Communications, Social Entrepreneurship, Financial Diversification, Fundraising, Managing Volunteers and Members, Cross-sector Communications, and Advocacy. 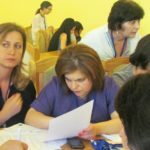 Partnering with the European Commission, the Austrian Development Foundation and the Social Workers Association of Armenia to help civil society organizations and local government departments working in the social sector in Sisian and Goris, Syunik marz as they implement new policy reforms designed to protect vulnerable families. Nowadays P&T NGO supports 14 communities in the Syuniq and Vayoc dzor regions as they implement civil initiatives and community development projects. This work is part of the civil society and local government support project being implemented by Counterpart International Armenia. Our expert team ensures close partnership between community working groups, NGOs, local government and the private sector. P&T NGO promotes the formation and development of youth groups of in selected communities, helping them to identify and resolve problems of local importance. In June, 2010 P&T NGO became a partner in the World Vision Sisian ADP Community Development Support Network which comprises 17 NGOs acting in Syuniq region, Sisian and Goris areas. 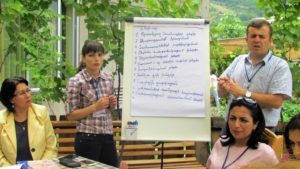 The goal of the CDSN is to promote the community development of the Republic of Armenia’s Syuniq region in the Sisian and Goris areas. We all work together to find solutions to community problems. You can learn more about the work of CDSN at www.hamaynq.am. Activities which P&T NGO coordinates across the CDSN network include community events on holidays. We also celebrate schools, families, seasons and special months. These community events have brought citizens together and have received a great response from the public. Besides training and consultation, P&T NGO provides other services too. These include project monitoring and assessment, research, organization development capacities assessment, event management, organization and facilitation of community meetings, organizing community mobilization, etc. As an organization certified by Counterpart 2009, www.gumiso.am, publishes and distributes its annual reports, to ensure transparency and accountability.